STOP PRESS :- Members of the Fire Authority have agreed to keep Pontyates Fire Station open – that’s great news, well done everyone for making your views known. Home > News > STOP PRESS :- Members of the Fire Authority have agreed to keep Pontyates Fire Station open – that’s great news, well done everyone for making your views known. 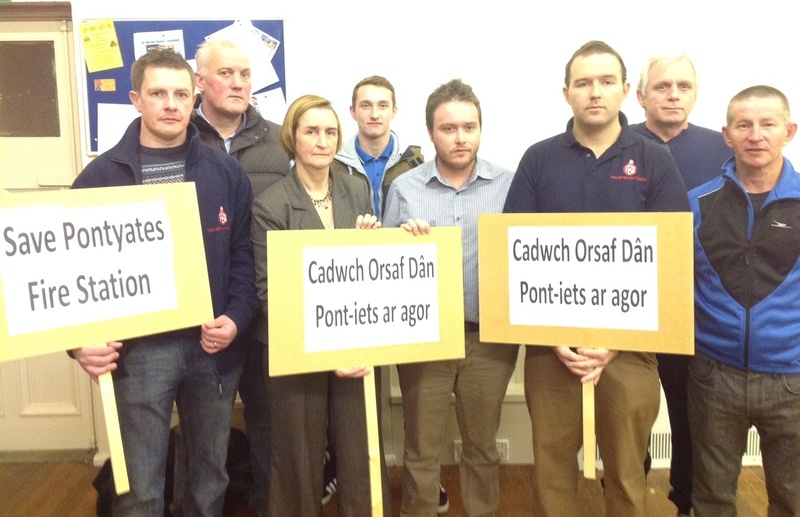 Local Firefighters with Nia Griffith MP and Fire Authority Member Cllr Calum Higgins at packed Pontyates meeting. L/R Simon Jones, Chris Jacobs, Nia Griffith MP, Spencer Chilvers, Calum Higgins, Andrew Hearn FBU, Kevin Worth and Albert Jones. Decisions about budget cuts will be made by the Mid and West Wales Fire Authority, which consists of councillors who represent the six county council areas covered by the Fire Authority.